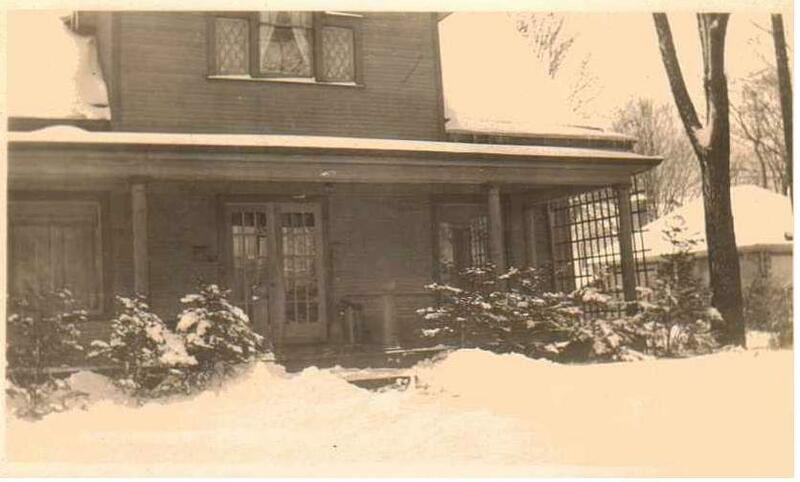 “Ashmoor” The McGawn Residence circa 1904 (Photo Date: February, 1943) was originally located at 6 Ash Street East prior being moved to its current location. Known as “Ashmoor,” the shingled Folk-Victorian home was Architect Designed and constructed circa 1904 – ’05 by Morris G. & Gertrude McGawn for their family. The McGawn home was considered very modern and boasted indoor plumbing that included hot running water, central heat and electric lighting as well. The three-lot estate parcel (1/4 of a city block) had many terraced planting beds and formal gardens which included two ponds and a stone wishing well. The estate employed a cook, maid and groundsman. The original carriage house is still part of the property and once housed seasonal staff on the 2nd level loft. The McGawn home is considered one of the historic homes of Three Oaks Village. At 14 years of age, Mr. McGawn started his career at the E.K. Warren Featherbone Factory, cleaning the company offices. He worked his way through the ranks and eventually became the Secretary of the Corporation. In later years, Mr. McGawn being a prominent member of the Three Oaks community; he and two partners founded The Bank of Three Oaks. “Ashmoor” was originally built at 6 East Ash Street, where it remained in the McGawn family through the early 1960’s. The small estate was situated on 1/4 of an entire city block with beautifully landscaped and terraced gardens that included 2 ponds and a real wishing well. The home changed hands a few times during the next 40 years when in 2004, the home was lifted off its original stone foundation and moved to its present location (around the corner at 204 Oak Street.) The parcel was sub-divided into 3 smaller parcels with the home receiving the most land. At that time, the residence received major renovations and upgrades to the infrastructure and mechanical systems. Most all of the original trim, moldings, inlaid floors, pocket doors / French doors and fireplace have remained intact and compliment the current decor. 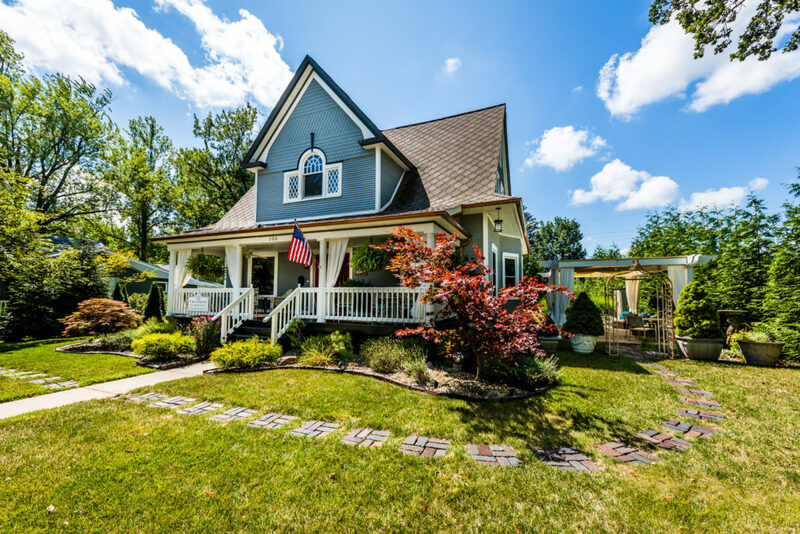 The current owners: Ron and Ken identified a need for overnight accommodations in the Village of Three Oaks and purchased “Ashmoor” in 2011 with the thoughts of establishing The Three Oaks Inn Bed and Breakfast. We continued where the prior owner left off and transformed the home into a boutique fine-lodging establishment. We offer our guests queen suites with private baths, fine furnishings and appointments. Our queen Sealy-Posturepedic Luxury-Plush bed sets offer quality bedding and linens for your comfort. The entire Inn has been appointed with fine furnishings and accessories from a mix of decorating styles and periods. Three Oaks Inn is available for single room or entire house rentals. Please click on the “booking & reservations” link for additional information. 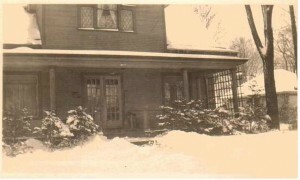 Ashmoor, the MG McGawn Residence circa 1904. Present Day: Three Oaks Inn. Three Oaks Inn is located within the Village of Three Oaks, near all of the fine art galleries, dining, entertainment, winery/brewery, distillery and shopping along Elm Street and Generations Drive. Three Oaks Village is a short drive from area beaches, vineyards and year-round outdoor activities. We are an easy drive to South Bend / Notre Dame as well. Three Oaks Inn makes a wonderful year-round destination with seasonal activities available in the surrounding HarborCountry area of Southwest Michigan.